SAP HANA Modeler option is used to create Information views on the top of schemas → tables in HANA database. These views are consumed by JAVA/HTML based applications or SAP Applications like SAP Lumira, Office Analysis or third party software like MS Excel for reporting purpose to meet business logic and to perform analysis and extract information. HANA Modeling is done on the top of tables available in Catalog tab under Schema in HANA studio and all views are saved under Content table under Package. You can create new Package under Content tab in HANA studio using right click on Content and New. All Modeling Views created inside one package comes under the same package in HANA studio and categorized according to View Type. Each View has different structure for Dimension and Fact tables. Dim tables are defined with master data and Fact table has Primary Key for dimension tables and measures like Number of Unit sold, Average delay time, Total Price, etc. Fact Table contains Primary Keys for Dimension table and measures. 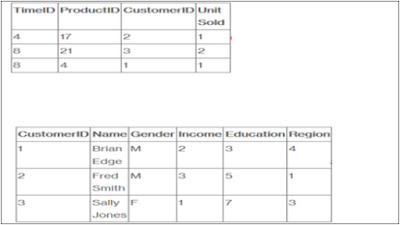 They are joined with Dimension tables in HANA Views to meet business logic. Example of Measures − Number of unit sold, Total Price, Average Delay time, etc. Dimension Table contains master data and is joined with one or more fact tables to make some business logic. Dimension tables are used to create schemas with fact tables and can be normalized. Example of Dimension Table − Customer, Product, etc. Suppose a company sells products to customers. Every sale is a fact that happens within the company and the fact table is used to record these facts. For example, row 3 in the fact table records the fact that customer 1 (Brian) bought one item on day 4. And, in a complete example, we would also have a product table and a time table so that we know what she bought and exactly when. The fact table lists events that happen in our company (or at least the events that we want to analyze- No of Unit Sold, Margin, and Sales Revenue). The Dimension tables list the factors (Customer, Time, and Product) by which we want to analyze the data.